A burnt vehicle is pictured at the crime scene following a stabbing incident in Melbourne on November 9, 2018. 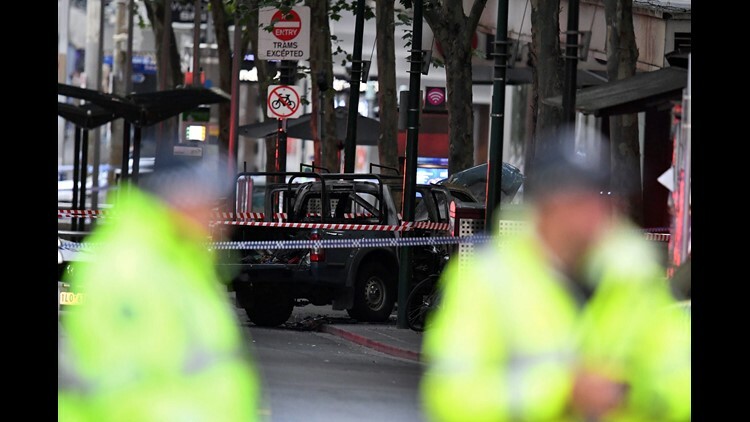 One person was killed and two others injured in a rush hour stabbing incident in Melbourne's bustling central business district on November 9, prompting police to shoot a knife-wielding suspect near a burning vehicle. SYDNEY – Police shot a knife-wielding man Friday after he fatally stabbed one person and injured two others in the center of Australia’s second-largest city, police said. The incident, which brought central Melbourne to a standstill in the late afternoon rush, came after police responded to reports of a burning vehicle. Officers were confronted near the burning car by a man “brandishing a knife and threatening them” while passers-by called out that people had been stabbed, Victoria state police Superintendent David Clayton said. Clayton said investigators did not believe there were any other assailants. The man, who was shot in the chest by police, was in critical condition. Clayton said a bomb squad was making the scene safe. “There’s no known link to terrorism at this stage. We’ll keep an open mind as to whether there’s any link,” Clayton said.